Just letting you know I'm going to Barcelona and Portugal for a few weeks for some rest, relaxation, touring, eating and merry making! So I won't be on here probably until mid August. But I will try to take as many photos as I can of the delicious fare that I will encounter. 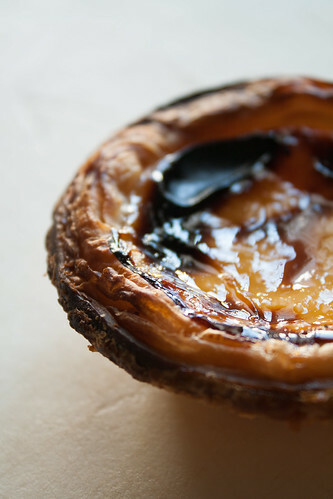 I can't wait to sink my teeth into real Jamón ibérico and Pastel de Nata (pictured below)! Adeus! Some great news on a personal front, my cousin and talented chef Isadora (a.k.a. Izzy) Sarto is going to be one of the contestants in Season Two of Food Network's Extreme Chef! I believe all the episodes have been filmed, and the first episode airs August 16th at 10pm ET/PT. The excitement is in the air! If you click on her name above, it links to "How2Heroes" where you can find all sorts of videos on how to prepare ingredients as well as great recipe ideas. I am sooo bookmarking it! As a former Chopped contestant as well, she's currently taking a much needed break doing some traveling (which already included seeing her favorite cousin! *wink) and relaxing after a full summer. Before that she had an Executive Chef gig during winter at the Mill in VT, and the previous summer at Pequot Inn on Fishers Island, NY. Whew, busy busy! Raising a glass to you cuz! Lots of sightings going on yesterday of Anthony Bourdain here in Seattle to film an episode of The Layover for this fall season. Capitol Hill peeps were all giddy over him, visiting various delicious spots such as the Melrose Market's The Calf & Kid Artisan Cheese Shop, Rob Roy, Dinette, Canlis and further south at Rainier Restaurant and BBQ! Some for filming, some for personal eats. I was on the hill too yesterday, but wasn't lucky enough to oh-so-casually pass by him and fling myself towards his towering frame, hand over my head exclaiming how "ghastly hot" it was in Seattle that day (ie. grovel for an autograph). Guess I'll have to get my Anthony-fix from "Bone in the Throat", which I've been reading as I make my way through all this books. I think I only have about 2 left...he better get on a new one soon! Oh I guess there's been sightings of all the Top Chef judges too around town. No official announcement that Season 10 of the show is in Seattle, but of course it's sort of a no-brainer after seeing all the twitpics and hearing about the spotting around town. All the hubbub can't be any better for marketing that's for sure!